Those faux bangs are so fun! Good way to decide if the style works for you. Loving your cozy weekend look. Loving Doug. 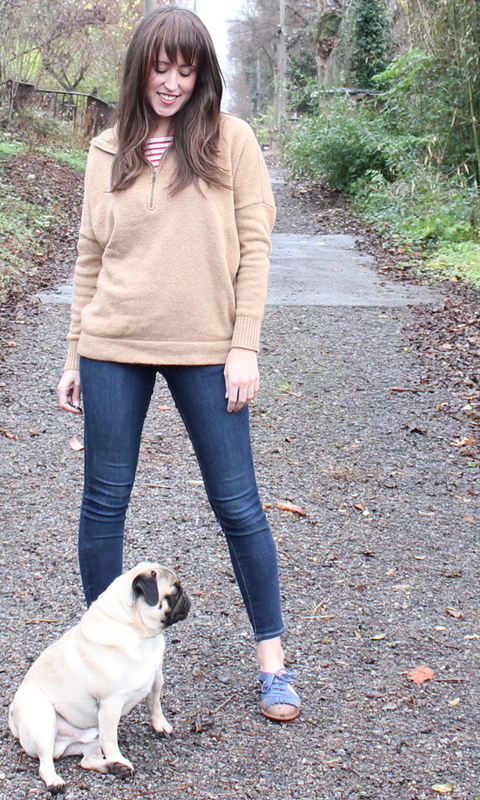 My pug does the same thing...needs to be beside me in every photo. I always go back and forth between wanting bangs and not, so maybe I need to try those bangs out! The faux bangs look really cute on you! I had bangs a few years back and they drove me NUTS because they had to be cut every few weeks like clockwork. Bangs really suit you! You look fantastic in this outfit! I love those shoes. We're having super warm weather too. It's bizarre. I don't love the cold, but it does feel weird to be a week into December and have 60-70 degree days. Love this casual look and your shoes are so cute! You look amazing with bangs! 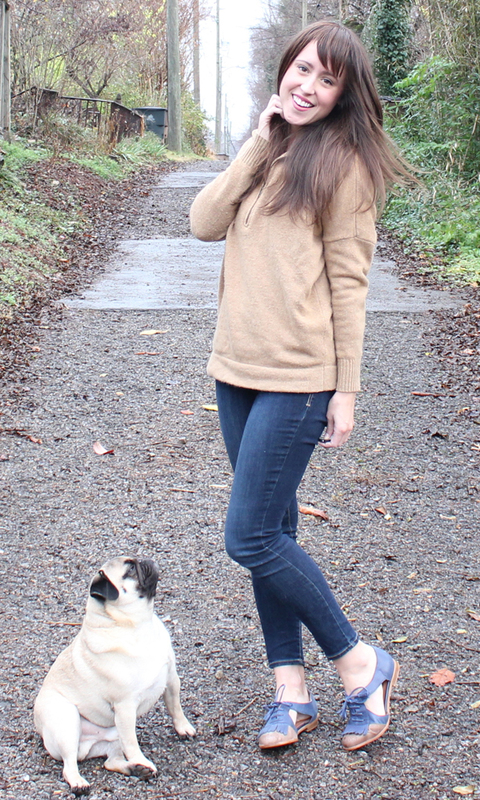 Loving the bangs and the free shoes.. and of course that adorable pug! I would have never known those bangs were fake hair unless you mentioned it. I was all prepared to compliment your new haircut...haha. "Your" bangs are adorable! I just cut some a few weeks ago. They take some getting used to, but completely worth it! I love the bangs! They look fantastic on you! I love your bangs! You look gorgeous! Free shoes are always good, and those are super cute! Congrats on them! okay YOU look amazing. seriously!! love the bangs and LOVE the shoes!! i can't believe those bangs are FAKE. I love these bangs!! So awesome. I'm jealous they match your hair color perfectly, I have naturally medium blonde hair and clip ins never match:( this is such a great weekend outfit! Those oxfords are adorable and so is your dog! Loving the bangs! What a great way to change things up! Those shoes are SO cute and you look so fabulous with bangs...love it!!! I know...this weather is INSANE...what is going on?! Your bangs look so real! I bought the same ones awhile ago and everytime I try them out they just look so... fake. And I would feel weird if one day I have bangs, and the next I don't. :) You are inspiring me to finally try them out! Those shoes are SO CUTE! And I love the stripes peeking out from beneath your sweater. You are SO adorable with the clip-in bangs! I would get some of those...but I have the real deal. A little less fun sometimes. Those oxfords are really fun too! Agreed on our crazy Nashville weather, was that thunder not the loudest you've ever heard?! Luckily (kinda) we're back to frigid temperatures again! Help a girl out and show me what you're wearing when it's 40 outside! The more and more I read about other people's pugs, I learn that Doug isn't a little weirdo... he is just a pug! So fun that they are all so alike! Definitely! I was super pleased with how well they matched my hair and blended seamlessly in... just clips in like a barrette! Aw, thanks dear! The boyfriend was a little confused when I walked into the living room with them too! Yea, I really lucked out that they matched so seamlessly - I got a hair color with highlights in it, I think the variations in color make it look less "fake"
I am going to try them out around my close friends this week - we shall see how it is! I wear "attitude" glasses too... so this is just added to this list of my "costume"... my boyfriends and girlfriends are starting to get used to it! Brrrr! You and that baby bundle better keep inside and stay warm! The bangs look adorable on you! AMEN to that, sister! We're in the 80s... EIGHTIES in December! And I packed up my whole summer wardrobe and stored it so thisssss is fun! Those bangs look adorable on you, and totally naturally! Loving the laid back weekend look too! Thank you dear! I got the "R6-30H"... From reading around the R6 is the base color, and the 30H means the color of the highlights. I opted for a color with a bit of variation (i.e. highlights) in hopes that it would look less flat (FAKE). Hope that helps! Cute bangs! I'm feeling the same about mild weather - it's making all this Christmas decoration stuff feel strange, but how can I really complain about barely needing a coat?! You can totally rock bangs! I love how people are trying clip-in bangs lately. I've had bangs for years (my forehead is the size of Texas!) so its fun to see them go in and out of style. I love everything about this casual look, especially your tousled hair. Gorgeous! And I hear you on the temps - it had been in the 80's earlier this month in Arizona and it was killing my Christmas spirit. Luckily I see temps have plummeted here in Nashville. Hope you're having a great week! love those faux bangs! I first saw them on Sydney of The Daybook. I def. want some for myself. And who could resist your adorable pup! I love this outfit so incredibly much. 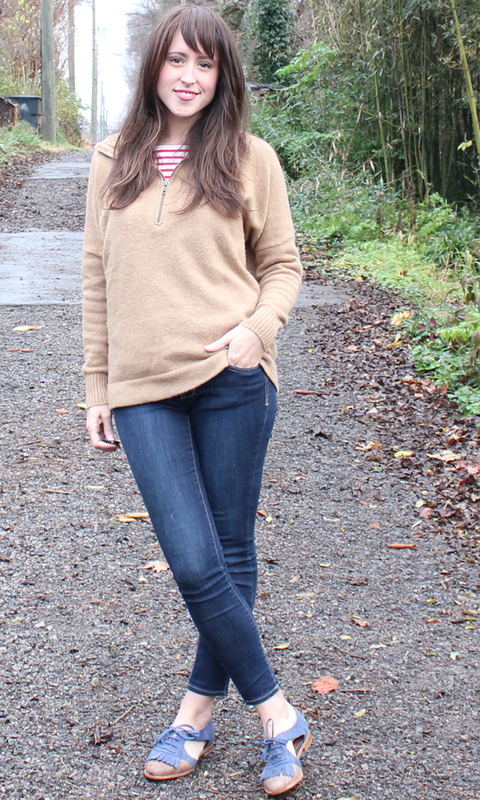 The cozy looking sweater plus the BEYOND gorgeous shoes. Love it. Your dog is also the cutest thing ever, ha love him. I most definitely am not dealing with 75 degree weather (so jealous right now). In Utah where I live, it's been around 0 to 5 degrees. Ya I pretty much have not gone outside in like 2 weeks. ha no not really but I've tried really hard not to at least!